“Did fashionable women dance (or practice?) tango with each other at home in 1913? At this distance in time, this might seem a mundane question. Yet if they did, this provides one concrete example, at least, with evidence, that women danced with each other for their own amusement and with not a man in sight. This image repays careful reflection. 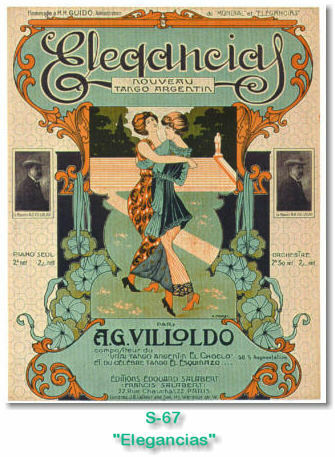 It is a detail, a centrally placed sketch on some sheet music for a Villoldo tango “Elegancias”, published in Paris and London in 1913. It is not like many images of women dancing with each other created at this time, in that it is not obviously meant to provide the conventional titillation of forbidden female flesh on flesh for the male gaze found in so many. It will have been created by a man (A. Morel, a man, I assume, here is all I could find by him https://uk.pinterest.com/pin/452330356301883844/ ) to make the music saleable. Who was it aimed at? Professional musicians, certainly, but what about the amateur market? There was a great deal of music making at home in both countries. Pianos were often a standard feature across the classes. Was it aimed at women themselves – or at least, not crafted to put them off by being risqué. These women are not exposing large areas of flesh nor exhibiting knowing smiles. They are well-covered and wearing fashionable “tea gowns”. “Tea” happened in the afternoon and it was normally a women-only affair. Despite the picturesque grand, landscaped park setting, I suggest the implication of the image of these women in these dresses is that respectable, fashionable women might dance the most fashionable (and daring) of dances, the tango, with each other at home. 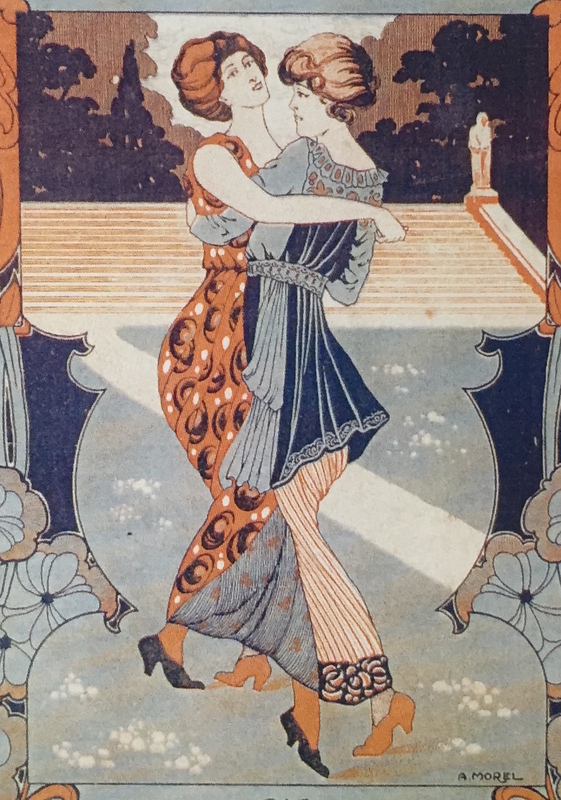 By way of supporting evidence, I have put beside it an image showing ‘mannequins’ or models dancing tango with each other in a parade for fashionable women also from 1913. Coincidentally, they are showing Lucile’s tea gowns:http://www.vam.ac.uk/…/2501…/lucile_aad-2008-06_20140723.pdf Self evidently, this public show of same-gender tango is meant to appeal to fashionable women so that they might imagine themselves dancing with each other at home in just such tea gowns. I know of little evidence at present that might tell us either way, but will keep it in mind as a potential balance to the welter of imagery showing men – away from home – dancing with each other. I reflected further on this and other images in a paper, “Tango teas, trousers and autonomy: images of women dancing with each other in early twentieth century imagery” given at the PoP Moves + Popular Culture Research Unit Conference, “Im/mediate bodies: materiality and mediation in popular culture”, on 15th October 2016 at Kingston University near London, UK.